Greater Noida (31/10/18) : Today as the whole nation is celebrating the National Unity Day and keeping it up with the spirit of the same, students and faculty members of Grads international school, also took Unity pledge . The program was organized to display the importance of National Unity and making students aware about contribution of Sardar Patel in uniting this country of kingdoms to country of States. Program was graced by the presence of Gajanan Mali, a Maharashtrian and founder of Ten News, who represented western India while Rev. Father Sebastian an educationist and Ex-Principal of Jesus & Mary School, Greater Noida hailing from Kerala represened the South.J.P.S. 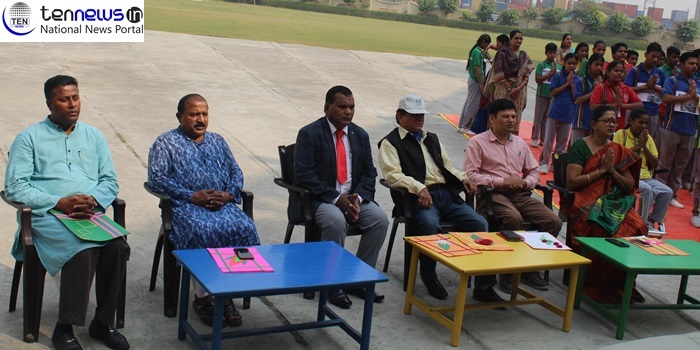 Rawat, President, Uttarakhand Cultural Association represented the North while the school Principal, Aditi Basu Roy from West Bengal represented the East in the National Unity Pledge taking ceremony. Patriotism and the love for the nation however, united each one of us, she later said. During the event, student sang national song and staged a drama displaying the diversity and various cultures existing in India. Principal of the school Aditi Basu Roy also spoke eloquently about the life of Sardar Vallabhbhai Patel. She narrated the lesser known facts of Sardar Patel to students and the contribution made by him in merging all the princely states into India as at the time of Independence country is divided into more than 500 different provinces.